The purported pictures and video of the Samsung Galaxy S4 that leaked over the last week may be closer to the actual device than we had initially imagined. In a new set of pictures released by Chinese site it168, we get not only beautiful photos of a similar device, but beautiful photos of a device that might be the real deal. The phone in these pictures looks very similar to last year’s Galaxy S3, but there are subtle differences here and there that Samsung will likely push. You can see textured finishes, a more polished gem-like home button, one hell of a vibrant display (1080p Super AMOLED? ), massive centered camera and flash (13MP? ), lower speaker, and a silver band wrapping the sides. The Chinese forum with the device is reporting that it’s running an Exynos 5410 Octa processor clocked at 1.8GHz with PowerVR SGX 544MP3 GPU. This is the GT-I9502 (same as previous leak), weighs 138g, measures 7.7mm thick, includes 2GB RAM, 16GB internal storage with a microSD slot and is powered by a 2600mAh battery. But beyond specs, the device apparently has an S Pen-like feature that we have seen on the Galaxy Note 2, though it doesn’t require you to use an S Pen. It involves your finger hovering close to the display without actually touching it. In places like the gallery, Samsung will allow you to hover your finger ever-so-close to the display to see a pop-up preview of imagery. This identical feature is already in the Note 2, but again, requires the S Pen. This feature appears to work the same without a pen. 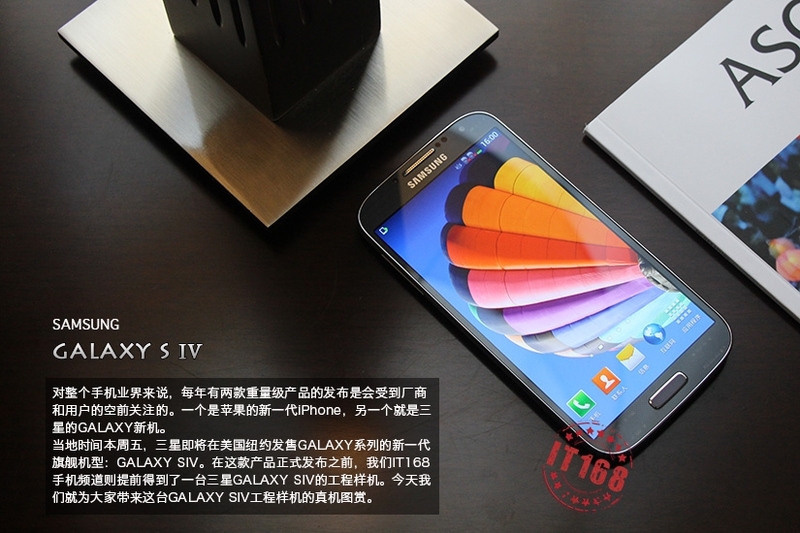 If this is indeed the Galaxy S4, we’d love to hear your final thoughts. We are less than 24 hours away from its unveiling, so give it to us!